It's spring break time and, naturally, I went to Mexico. But instead of hitting Cabo San Lucas' coed and mega hotel scene, I headed to Todos Santos, its quieter, artsy neighbor 1.5 hours to its north. In Todos Santos, there are artists and boutique inns, and the craziest party is an annual historic home tour, in which dozens of homeowners open their doors so curious travelers can see what beautifully restored 19th-century haciendas look like. There are less than 80 hotel rooms in town. It was a refreshing change on a recent stay at the Guaycura Boutique Hotel & Spa, which opened in late 2010 in an early 19th-century brick property in the center of town. Building on Todos Santos' funky, neighborhood-y, and quiet character, the 14-room property features original hand-painted Renaissance Moresque ceiling motifs, a small gallery showcasing the works of local painters, a film and photography exhibition area, and a cozy rooftop bar (pictured above) for watching fiery-colored Baja sunsets over fresh mango daiquiris and strawberry margaritas. Guaycura guests can take art, poetry, and music classes in town, where there are 40 galleries, shops, and studios. Or they can get adventurous: It's possible to whale watch nearby, visit a sea lion colony, go horseback riding on the beach, help with the local turtle release effort, rent an ATV, take cooking and surf lessons (as I did), or go sailing. Nanny services are free, too. Because spending lazy afternoons is a crucial part of any vacay, the hotel's rooftop heated swimming pool and spa is a focal point of the property. After all, the “art colony” of Todos Santos is an oasis in the desert. Flanked on the east by Sierra de Laguna mountains, it's separated from the Pacific Ocean by three kilometers of lush palm trees and ancient mango and palm orchards. Todos Santos is one of seven Mexican Pueblos Magicos (magical towns), as designated by the Ministry of Tourism, and is the only one in Baja. This town may be small, but artists and tourists gotta eat, right? It's no wonder that with so much creativity flowing in Todos Santos that the art of cooking is taken seriously here. Consequently, Guaycura's main attraction is the works of chef Alejandro Arán Sánchez, who, at 27, has managed to master a savory, unpretentious Baja Mexican-Mediterranean style (think fresh shrimp on a bed of spinach and confit mushrooms with three chiles cream sauce, or catch of the day huatape over roasted vegetables and risotto). Dining at the Guaycura is also a great opportunity to try rare and award-winning Northern Baja wines, of which more than half its wine list consists. Now that's a spring break. The Guaycura is located between La Paz, about one hour’s drive to the north, and Los Cabos, about 1.5 hours to the south. Rates range from $195 to $500 nightly. 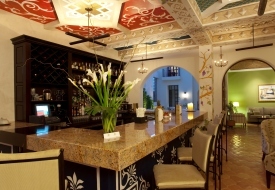 Right now, the Guaycura is offering a food and wine package for two that includes three nights’ accommodation, daily breakfast, gourmet tasting dinner with wine pairings, an authentic Mexican cuisine cooking class, a visit to local cheese and fish markets, and a tour of Todos Santos for $1,159 plus a 14 percent tax and 10 percent service charge. Visit www.guaycura.com.mx. For general trip-planning information, see our Cabo San Lucas destination page, then use our Travel Search price comparison tool to find the lowest rates and travel deals on hotels, flights, and vacation packages to Los Cabos.